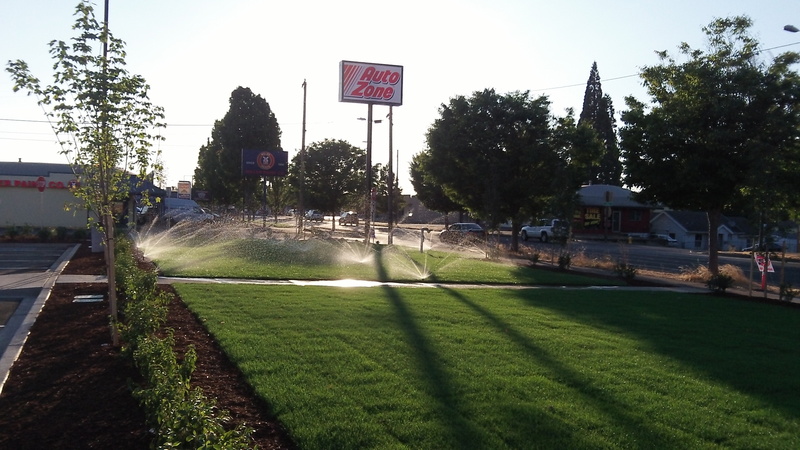 Drought or no drought, we keep adding lawns that need irrigation to look as lush as this one. Does that make any sense? So far the answer is both yes and no. Until a few months ago, this property along Albany’s Pacific Boulevard was a barren wasteland, the site of a former Mexican restaurant demolished years ago. Now it’s home to a new business, and the property, besides being useful again, also looks a lot better. But what about all that new grass? What about all those sprinklers sprinkling away on a Sunday night when we haven’t had any rain since early June and rivers are running lower than most of us have ever seen them? As it turns out, there’s little choice. When a site like this is developed, landscaping is required by the Albany development code, which also says that irrigation must be provided to keep any vegetation alive. The code doesn’t actually require lawns as such, but chances are a rock garden would not quite right in a place like this. There’s also the money angle to keep in mind. The city’s water department runs on water revenue, and even though many homeowners prefer tan yards to pouring vast sums of money on the ground, a dry summer means water use goes up, and so does the income on which the system depends. Since that “instant lawn” was just installed, I don’t think they have any choice but to water it until the roots get established in the sub soil. The Albany Development Code permits landscaping plants that do not need to be irrigated as long as a licensed landscape architect, landscape installer or certified nurseryman can certify that the plants are drought-tolerant. I suspect we will see much more of this in the future if we’re moving into a dry weather pattern. Just to add, commercial rates are lower than residential rates. Just to clarify. Albany has declining block rates. That means that the price per unit. Of water goes down the more you use. That means that industrial and commercial users that use large amounts of water pay proportionately less. Lots of water purveyors still use that model. A reason often cited is that it protects/attracts businesses which means more jobs. Landscaping is broad term. Requiring landscaping to be “maintained”, which might include watering, is a good idea. I would be VERY surprised if native vegetation, with a drip irrigation system, would violate the code. A rock garden would probably pass too, is my guess, as long as it was maintained.